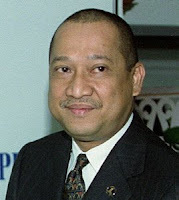 rocky's bru: Nazri to head Public Transport Commission? Does Najib really want the Commission to fail? NazriAziz seems to be making all the important announcements on transport matters lately. Last month he made the front pages with the news that the proposed road transport Bill was not going to be pushed through, yet. That Bill was meant to show no more mercy to serious traffic offenders (For now, the highway killings will go on by Azmi Anshar, NST). Now he's made the announcement that the PM has made it known to him that he WILL BE heading the new Public Transport Commission. With many things Nazri, this last one has not gone down well at all with even the pro-government bloggers. JMD describes Nazri Aziz pre-empting the PM as disturbing news. Read also Should PM Najib lead SPAD? "Najib is still heading UMNO and government?" Buat kerja dengan baik dan mulut jangan celupar. yahoo, bole dapat permit taxi untuk diri sendiri lagi. Rezeki dtg bergolek. Thats whats goin 2 happen if Nazri is in charge . . . goin straight to the toilet. Kena tendang keluar kabinet dan turun pangkat lah tu...jadi sebelum kabinet baru diumum, cepat cepatlah bagitau, dapatlah cover sikit malu tu. Taxi Nazri musuh ketat Madey...begitu jugak dengan Rocky !! Banyak lagi orang berkaliber untuk menggantikan NAZRI ni. This is a classic example of an UMNO buffoon who never seems to fail to put his foot in his mouth and seems to always get away with his idiotic comments. If DSNajib wants to be taken seriously, he should drop this buffoon from cabinet soon. If he still in cabinet then I pity the UMNO party for having to make way for a buffoon like Nazri! There goes the Public Transport System.. We are so doomed!! PM jgn lagi berlembut atau tolak ansur dengan Nazri...singkir terus. kalau dia masih ada dlm umno pada pilihanraya akan datang, saya antara ramai di Padang rengas akan ucap selamat tinggal kpd UMNO...nazri ni hanya jaga kuncu2 dia saja di Lenggong dan Kuala! This character is one of the greatest clowns in the UMNO circus and it is not a surprise that they really do not have anyone with real substance to tackle this transport problem which has been affecting the nation for decades. After all he couldn't even solve the the notorious taxi problems, though he is more affectionately been labeled the Taxi Minister. This guy's posterior extends to his mouth, so you know what he talks most of the time. This appointment spells disaster for the transport community, more so to the citizens. Mr. Smart Head should use the public transport service ( so should the rest of the Big Heads) daily instead of moving in grand limousines with the unproductive Police Escorts who could do much better jobs in traffic control tasks. Take the Challenge and travel what the ordinary man or woman goes through in their daily life, until then you are just wasting everybody's time and efforts, which obviously you do not possess. Dah tak dak orang lain ka? Asyik recycle orang tak guna je? Kering sangat ke pucuk kepimpinan UMNO? PLEASELAH!! Cukup2lah dgn permit teksi!!! Takkan nak sapu semua kot!!!! Putting this guy to head the Public Transport Commission will sure make public transport one hell of a mess.